The Ex guitars meet Nilssen-Love/Vandermark Duo. Lean Left throws together two explosive duos - the sax/drums collision course of Ken Vandermark and Paal Nilsson-Love with the piledriving guitarists from The Ex - to make up a positively apocalyptic quartet: an elemental musical force featuring Grade A international players zoning in and scrambling together rock, jazz, noise and blistering free improv into a highly-charged onstage assault, each member taking their sounds and bodies to the edge and often snapping out of the wilds and into glorious passages of regular rhythm. Recorded live at Café Oto, London in 2011. The music of Lean Left is extrovert, energetic, powerful and inclusive but also confrontational and provocative: where rhythm, noise, melody and harmony melt together in perfect union. 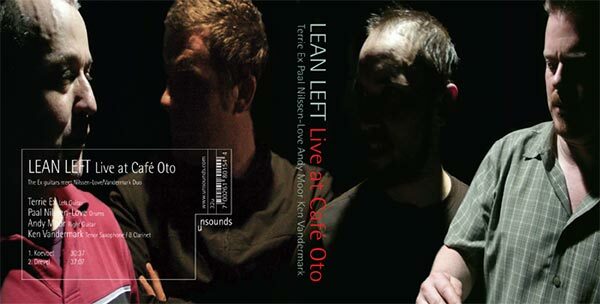 In two tracks “Live at Café Oto” captures one moment of high powered, highly varied improvisation. Pretty much the dream ticket for those who like their live music raw, hard and violently soulful.